“Vital Laughter,” Atlantic Monthly, 1954. Frances Dunn Judge was talking about her grandmother Lucy Nesbitt Shive, an early Jackson Hole homesteader, when she penned those words in 1954. It is difficult to describe the type of woman who often calls Jackson Hole home, especially during the early 20th century. Homesteaders were self-sufficient, hardy and hard working. They played as hard as they worked, and immensely enjoyed the spectacular scenery around their rustic homesteads. In such country a woman had to be as skilled as her husband with a hatchet as she was with a needle. It didn’t hurt if the reverse was also true, and it often was. This exhibit is inspired by the Jackson Hole News & Guide’s annual “Jackson Hole Woman” special edition. It is intended to highlight and celebrate the unique women who called this valley home when all members of the family were considered capable ranch hands. From raising children to cattle, they prided themselves on their self-reliant attitudes and “didn’t give a damn” what the outsiders thought. The Jackson Hole Historical Society and Museum is proud to share the stories of these strong women and plans to update this exhibit annually. Maggie Sullivan was born on January 2, 1846 in West Virginia. Like many families at the time, Maggie’s south better prospects out west. When she was 16, they settled in Colorado, after a brief stay in Iowa. It was here in Colorado that she met her husband John Simpson and the two were married in 1866. In 1893, John and Maggie were among the first dozen couples and families to call Jackson Hole their permanent home. They settled near the mouth of Cache Creek and began the necessary requirements to acquire their homestead patent. In 1899, the patent was in their hands, and they began to think about creating a community out of a few haphazardly placed homesteads in the area. In 1893 when Maggie and John first arrived in (then called) Jackson’s Hole, their homestead was near the Post Office of Marysvale, but it had no official name. The next year in 1894, Maggie applied for the position of postmaster and the Post Office (a box and a wagon) was moved to their property. The first postmaster, Fred White, had named Marysvale after his wife, Mary. Maggie felt the area needed a less individualized name to grow a community around. She picked “Jackson.” In these early days, the Simpson homestead, with its posh two-story log house, was the community-gathering place. As the site of the only Post Office in the valley, all roads led to the Simpsons. As the population grew from about 28 individuals in 1889 to over 638 by 1900, Maggie began thinking of ways to lessen the foot traffic on her property. 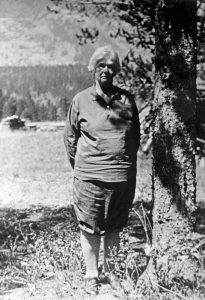 She and John gave five acres on the north-western corner of their homestead to a newly-formed community group called the Jackson Hole Gun Club. They set about constructing a Clubhouse, which became the valley’s first community gathering space. The post office would move in here, along with space for meetings, dances, and nearly any community need. Jackson had been put on the map, and Maggie saw an opportunity. She filed for a forgotten 40-acre lot, and received the patent in 1900. She then sold ten acres to Grace Miller, who had plans to draw up lots to sell for homes or businesses. Today, this lot is located between Deloney Street, Flat Creek, and Cache Street. The valley’s first general store, livery stable, hotel and saloon quickly emerged on these lots. Maggie’s children would go on to open the first drugstore, give land for the first cemetery in town, and draw up the first map of the newly formed “town of Jackson.” After John’s death in 1921, Maggie was diagnosed with a heart condition and told to seek lower elevations for relief. She moved to San Diego to live with a daughter. She wasn’t gone for long, after her death a year later; her family returned her to Jackson and buried her alongside her husband in the Aspen Hill Cemetery. While the Simpson homestead is no longer visible, her mark remains on the landscape. The town of Jackson retained her name, the lots she drew up with Grace Miller can still be seen today, and the Clubhouse remains on the town square. East Simpson Avenue transects the land that was once part of their homestead. For those who know where to look, the Simpson legacy continues to be a strong reminder of the resourceful individuals who saw potential in their small community. 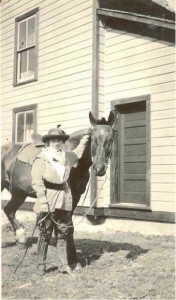 Pearl Williams and her horse. Pearl Williams was born on October 24, 1897 in Colorado, the youngest and only daughter of Otho and Josephine Williams. With five older brothers to contend with, Pearl learned from a young age how to keep up. When she was just two years old in 1900, her family moved to Jackson Hole in the spring. By mid-June when the census was taken, her father and older brothers were listed as farmer and day laborers on their ranch. They had taken up a homestead along today’s Route 22 between Wilson and Jackson. It was here that Pearl learned how to ride a horse and take care of herself in the rugged country. She was a skilled marksman and was known for her horse-riding talents. When Pearl was old enough, she took up a job as a clerk in the drugstore in Jackson. Locally, she was known as the soda squirt. In 1920 at the age of 22, she was called upon by Grace Miller, the newly-elected mayor of an all-woman town council, to become Jackson’s first female marshal. 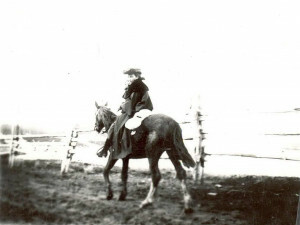 Pearl took up the role, believing she was chosen for the position due to her father’s work mapping the town that Grace had planned, and she owned her own horse. Despite her small stature and friendly demeanor, Pearl was met with no trouble. By 1920 the town was fairly quiet, and the legends of horse thieves and rustlers were of a different generation. The newspapers, upon hearing of the all-woman government in this “wild west” town took up most of her time, trying to schedule interviews with the young marshal. By the time a reporter got through, Pearl had already retired and resumed her job as the drugstore clerk. When the reporter asked why she had left her post, the response was, “She says the town is now so quiet they don’t need a marshal anymore. She says she didn’t make any arrests, and so she didn’t have to go hunt up a jail. She says that a while ago she killed three men and buried them herself and that she hasn’t had no trouble with anyone since.” Pearl, it seems, was having some fun with the reporter looking for a major break in the story of a young woman holding a high post. She had fielded so many questions, and was tired of giving the same answers. In truth, she had dragged some drunken cowboys to the town jail, but the cells had no doors. She ordered them to stay put, and they did. Mostly she kept stray cattle out of the town square. 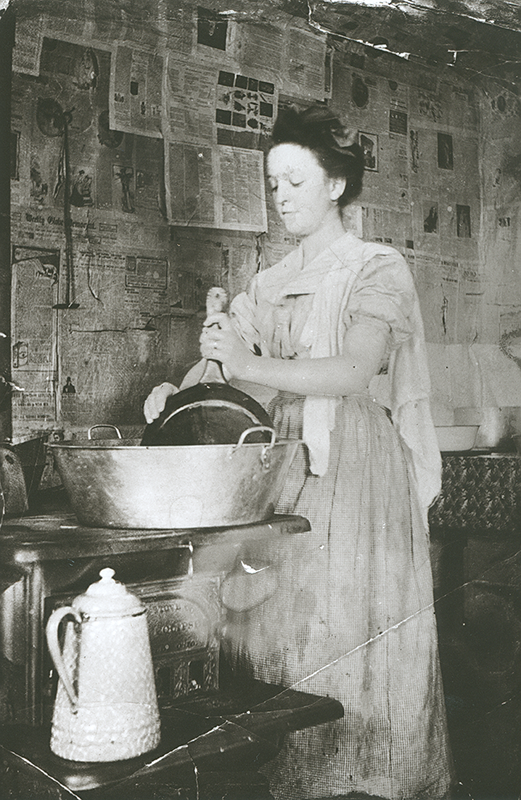 Born to a frontier family on November 5, 1866, Geraldine was exposed to pioneer living at an early age. She quickly outgrew her small-town life and went on to pursue higher education at Oberlin College and graduated with an education degree in 1898. Before attending college, she attempted the life that was expected of her, getting married young and starting a family. Six months into her pregnancy and marriage, she decided to follow her independent nature and divorced her husband. Upon their divorce, Geraldine reclaimed her maiden name for herself and her son. She then moved to New York City where she maintained a fulltime career as a music, art and sewing teacher until her retirement in 1912. Having enough of city life, Geraldine decided to join her siblings out west in Jackson Hole. In 1913 after a year of surveying the valley, she filed for a 160-acre parcel north of Moose and directly underneath the Grand Teton. After several years of bureaucratic hurdles and turmoil, she was approved for 159.97 acres. She made the necessary improvements to the property, but rarely undertook any manual labor other than gardening and general maintenance. Due to her successful teaching career, she was able to support herself in a comfortable retirement. Her cabin had no electricity or plumbing and she made her own clothing. She did, however, amass a large library of over 1,300 books. These books would sustain her during the long winter months that she often referred to as her “hibernation.”On August 2, 1924 a 58-year old Geraldine successfully summited the Grand Teton with the assistance of a 16-year old Paul Petzoldt. She was the second recorded woman to make the climb. Not one to sit still, Lucy turned to taxidermy as a hobby which was grudgingly supported by her wary family. She often had some form of crafting to work on, including teaching Jack how to embroider. He was quick to learn, and they prided themselves on being equally adept with branding iron or needle. Another long-standing project was to line the cabin walls with what Lucy called “wallpaper.” Reading materials were a rare source of entertainment on the ranch, especially magazines and newspapers. These were also perfect wall-covering materials, as Lucy never saw value in reading much to Carrie’s chagrin. In a compromise, Lucy always hung them right-side up, and Carrie could read bits and pieces of different stories. She acquired a set of opera glasses that enabled her to read the ceiling. Margaret “Mardy” Murie was born on August 18, 1902 in Seattle, Washington. 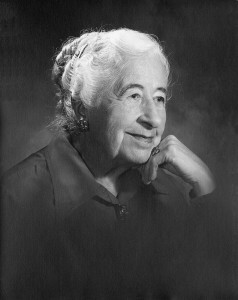 She attended the Alaska Agricultural College of School and Mines where she became the first female graduate in 1924. That same year she married Olaus Murie and the two spent their honeymoon on a research trip studying caribou for eight months. 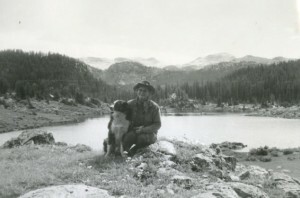 Olaus worked for the U.S. Bureau of Biological Survey and devoted his life to an emerging field of conservation research. 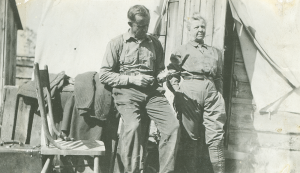 The two moved to Jackson Hole, Wyoming so Olaus could study the deteriorating elk populations in 1927. Initially living in town, they began to search for a home in a quieter area of the valley. They became friends with Buster and Frances Estes who owned the STS Ranch in Moose. In 1945, the Muries purchased the ranch and moved in to a large cabin that was previously a private home on the property. As part of the purchase agreement, the ranch could not be used as a dude ranch, and the Estes could keep their original homestead cabin. Both wishes were fulfilled, as the Muries wanted a private home for family and friends. They removed the established pathways and allowed wildlife to return to the property and used their natural trails. By 1948 the Muries became the sole owners of the ranch, and the Estes moved permanently to Arizona. Now known as the Murie Ranch, the dude ranching history has been largely forgotten. During their time in Jackson, the Muries had three children. Rather than being stuck at home with her babies, Mardy packed them up and brought them on research trips. In 1950, Olaus became president of the Wilderness Society, and the ranch was the perfect location to host their annual meetings. 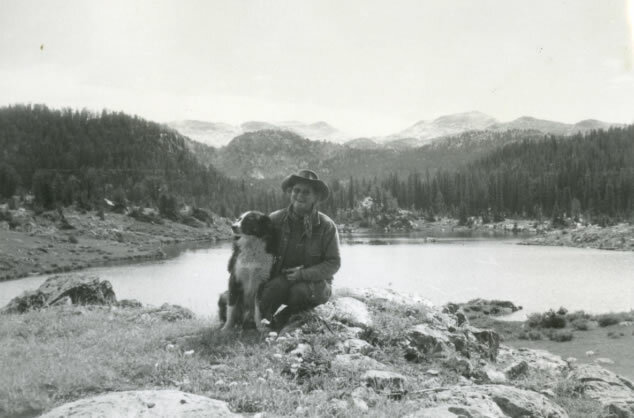 Mardy kept diligent records of her husband’s work, and they increasingly worked together to encourage legislation to protect America’s wilderness resources. Their long career was cut short in 1963 when Olaus died. Just a year later, the Wilderness Act was signed by President Lyndon Johnson. Rather than giving up her ranch and moving on, Mardy devoted herself to work as a wilderness advocate. She wrote speeches, letters, books, and appeared in movies. Her work spanned the globe, from Egypt to Australia. 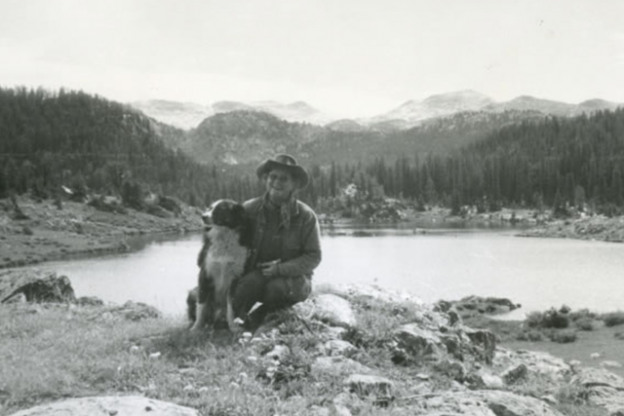 Upon returning to Jackson Hole, Mardy sold the ranch to Grand Teton National Park in 1968 with a life lease. She continued to travel to Alaska for research trips and conferences that resulted in several honors and awards, along with her other conservation work. She received the Audubon Medal, the Sierra Club John Muir Award, the Wilderness Society Bob Marshall Award and a Presidential Medal of Freedom. These accolades are significant because she was one of the first women to receive such recognition for work the conservation field. Upon her death in 2003, the life lease on the ranch ended and the property transferred to National Park Service ownership and management. Today it is known as the Murie Center, which continues to educate the public on the importance of conservation and natural resource protection. Betty Woolsey out for a walk with her dog. Courtesy of Trail Creek Ranch. Elizabeth “Betty” Woolsey was born on December 28, 1908 in Albuquerque New Mexico. Her family lived in the shadows of the Sandia Mountains, while her father worked for the U.S. Forest Service. As the oldest of her four sisters, Betty had boundless energy as a child and her mother would often send her on her father’s research trips. Here, she had an early introduction into an outdoor lifestyle that would continue for the rest of her life. She learned skills in campsite selection and building, campfire cooking and the endurance to withstand long hot days in the blazing desert sun. When her family moved to New Haven, Connecticut, Betty found herself bored by the smooth countryside and picket fences. There were no mountains or caves for exploring so she spent her time mastering team sports and earning a degree from Vassar. That Christmas, Betty’s father gave her a 120-foot climbing rope that she promptly took on a trip to New Mexico. Betty went on to climb several formidable peaks around the world. Her many adventures also included many close brushes with death that included running out of rope while rappelling down a mountain. She extricated herself by swinging back and forth to jump onto a ledge. On the Waddington Expedition, she fell into an hourglass-shaped crevasse in the Franklin Glacier and was able to dig herself back out. During her climbing expeditions in Switzerland she was convinced to return in the winter when the higher peaks were better accessed by skis. The first trip included her first self-taught skiing lesson. Despite the early frustrations, she proved to be a natural. Just weeks after her first trial on skis, she participated in a race that qualified her to become part of the first U.S. Women’s Olympic ski team. In 1936, she competed in her first Olympics in Germany. She placed seventh overall, and shocked the European skiing world. She would continue to win several races and earned international recognition. With the advent of World War II, Betty and her fellow racers began to put the American Rockies on the world stage for ski racing. They found their new home base in Sun Valley, Idaho which had several modern amenities that the European resorts lacked. From here, she learned of a nearby, quiet mountain valley already known for its soft powder snow. In Jackson Hole, Betty would find her true home on the Trail Creek Ranch that she purchased and opened up to dudes year-round. With her team of close friends, they outfitted the ranch with plumbing and electricity by hand. Betty’s favorite ranch chore was irrigating her extensive hayfields, reveling in expertly maneuvering water throughout her property. Her dry childhood in New Mexico gave her a life-long respect and appreciation for water. Despite her death in 1997, Betty’s legacy of adventure continues to live on at her ranch, which still hosts guests today.